The final finishing gun has sounded, the Green Parrot has run out of rum, and the roosters of Duval Street have given a final cocka-doodle-doo to mark the end of the 25th anniversary of Key West Race Week. What inadvertently turned out to be one of the greatest editions thus far with perfect sailing conditions and a lay day due to lack of wind in the middle of the week, this event never disappoints and the only shame is that more US sailors were not here to partake; it’s the best event our country has to offer and for reasons that cannot be pinpointed, the weekend warriors that are the lifeblood of US Sailing are watching from afar. The top-end programs are still attending, and KWRW is important for pro-sailors as it serves as a huge networking opportunity with owners and team managers actively setting schedules and ramping up for the year of racing, but the legions of PHRF and one-design sailors from the great white north that can typically be seen listening to Jimmy Buffet and lounging on their boats for hours after racing have become rare. 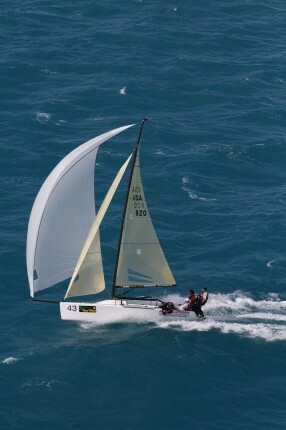 KWRW built up a reputation of being on a bucket list for many sailors around the globe, and fingers crossed, whatever chased away the common sailor will have passed by next year’s edition. 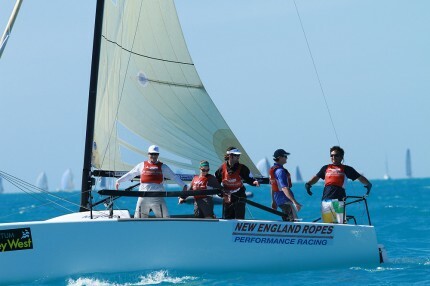 In early December, it looked liked I would be watching from the sidelines as the Volpe Melges 32 team was not planning to attend and most other teams I talked with were using this event to try out new team members to start priming for the Worlds coming up in September. Getting nervous that my string of 5 KWRW’s in a row was coming to an end, I lobbed a facebook IM of “what are you doing for KW?” to Bora, and plans were quickly in place to get a team together on his 24, assuming he could dig it out of a frozen shed in Michigan. Blasting downwind on Day 1. I had not sailed with Bora up to this point, but duking it out with him in years past, I knew I would be learning a lot throughout the week and we would have a shot to win. With Bora’s “do whatever it takes” attitude to get on the starting line, I also knew that I would be taking a trip back to the grassroots, get-on-the-water and get-racing-at-all-costs type of mentality that seems to have been lost in recent years. I didn’t think I would miss the college sailing days of cramped sleeping quarters, lurking around other teams houses’ like tarpon under a dock in search of dinner, or giving an audible “sweet!” when discovering a day old slice of pizza on a cluttered kitchen counter before anyone else, but it just shows that if you have a fun team at a great venue, not much else matters…now if I can just find those 1,000 thread count bed sheets, my slippers and mint scented bubble-bath when I get home. The reward for our tight living quarters was a highly competitive team and sailing conditions that any sailor dreams of. After hiccup in our results on Day 3 with a 6th place, we were able to return to our winning ways and take a few more bullets, and only needing to grab a 4th or better on Friday, we nabbed a 2nd and got the job done with a race spare. The 24 fleet was a fraction of the size from years past, but with a few top teams in attendance, the racing was still as good as ever and hopefully the 24s will flock back to this event in coming years. For anyone pondering…it is worth it. Like a Packer fan at an all-u-can eat buffet, we were welcomed to Key West with open arms and after partaking in the bounty at hand, we all parted ways exhausted, smiling, thankful for the memories, and very excited to get home. Once the 24 was all put to bed on the trailer, we made way to the Halfshell Raw Bar for a few frosty pitchers and ensuing Gentleman’s chugs, and from the naming of Biscuit, to the discount double-checks, Troll’s unruly sanitary behavior, Andrew’s snoring and Bora’s weak coffee, new inside jokes will be shared the next time our paths cross, and if real friends were counted like they are on facebook, each of our tallies went up by a few. Discount Double-Check after our team clinched the win.